Schroer & Sons Metal Roofing Systems recently completed two beautiful projects that joined the beauty, durability and everlasting benefits of a ClickLock Premium Standing Seam with the energy independence of solar panels. Standing seam metal roofing is the perfect foundation for solar panels. It is important, and sometimes overlooked, to consider the condition of your roof before installing a solar panel system. On a perfect roof, under perfect conditions, with the perfectly ventilated attic and an extreme weather-free environment, installed perfectly with every nail in the perfect location; the average asphalt roof will last for about 20 years. Now, take that perfect roof, add some weather elements – extreme heat, hail, snow pack. Also factor in the possibility that your attic might not be ventilating properly. An even worse scenario is that your asphalt roof has been laid over an existing layer of shingles. Any or all of these factors have decreased the longevity of the asphalt roof by 25%-50%. That brings the realistic lifespan of the average asphalt shingle roof to 10-15 years. The average solar panel system is designed to last 20-25 years. The math is simple. It simply does’t add up. 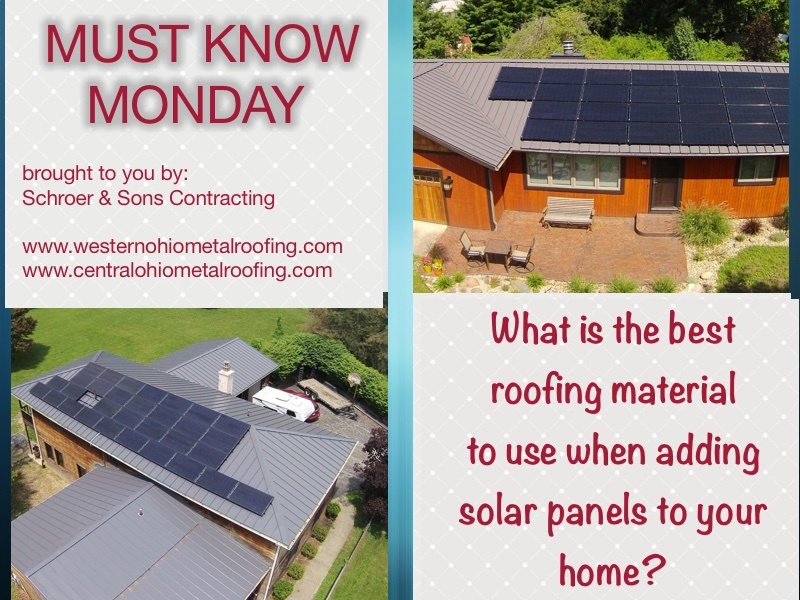 Your asphalt shingle roof will NOT outlast the life of your solar panels, even if it was installed in the same week as your solar panel system. ClickLock Premium Standing Seam is a maintenance-free, lifetime roofing product that compliments solar panel installation like no other. ClickLock is one of only a handful of roofing systems that comes with a limited LIFETIME warranty. There will be no question as to whether or not your roof will outlast your solar panels. ClickLock has a distinct, beautifully designed seam that works perfectly with solar panel racks. A rack mounting system eliminates the need for holes and screws to be used on the roof. Simple, clean, hidden fasteners mount the solar panels seamlessly to the ClickLock Premium Standing Seam. The result is a perfect, durable roofing system paired with an environmentally friendly solar panel system. It is up to the homeowner to be proactive about the condition of their roof. Do not rely on the people installing your solar panels to point out potential problems with your roof. A thorough, accurate and honest roofing evaluation should be done by a roofing professional. Of course, asphalt shingles and ClickLock Premium Standing Seam are not the only options for roofing under solar panels. Call Schroer and Sons Metal Roofing Systems for an in-home consultation. We will give you the best advice on roofing options available for your specific needs and budget.